Scientists continue to probe for natural causes of the biblical plagues that devastated ancient Egypt. Yet the more important question is not how but why. The story of the ancient Israelites’ release from slavery to the Egyptian Pharaoh has become legendary. It’s the stuff of Hollywood movies, from Cecil B. De Mille’s 1956 classic, The Ten Commandments, to the recent animated DreamWorks production, The Prince of Egypt. The Exodus led to the establishment of the Israelites as a nation under God’s rule—a nation whose story provides the subject matter for most of the Old Testament. It provides a cornerstone of faith to millions of people and forms the basis of the principal celebration of the Jewish people—the Passover. Integrated within the well-known Exodus account is another story: the drama of the 10 plagues that devastated Egypt and eventually led to the release of the Israelites. Did those plagues happen in the way that is described, and can we learn any lessons from this remarkable story? In the mid-1990s, John S. Marr, for many years the principal epidemiologist for the New York City Department of Health, teamed up with Curtis Malloy, a fellow epidemiologist who was skilled in international health, infectious diseases and entomology. Their goal was to unravel the mystery of the 10 plagues. They were not the first to attempt an explanation, and no doubt they will not be the last. But their approach was to analyze the plagues as an integrated whole, applying a wide range of modern scientific disciplines. As far as they were concerned, their research would neither confirm nor refute the biblical declaration that God caused the plagues. They felt their findings could demonstrate for believers the mechanism through which God’s purpose was accomplished. For nonbelievers, it could show that these biblical events might actually have happened according to sound scientific principles. Their findings formed the basis of a documentary first shown on British television in 1998. As Exodus 8:22 points out, the Israelites dwelled a short distance away from the Egyptians in a region the Bible calls “the land of Goshen,” situated in the eastern part of the Nile delta. According to Marr and Malloy, this geographical separation might rationally explain why, as the Bible records, the Israelites were spared some of the plagues. 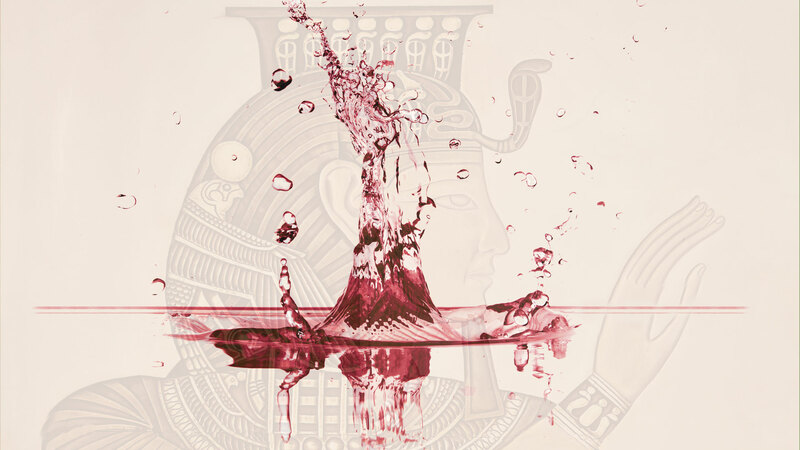 In the first plague, the Nile turned into a river of blood (Exodus 7:17–25). The most likely explanation for the river turning toxic and red in color, Marr and Malloy concluded, was a freshwater algal bloom called Pfiesteria, a single-celled organism that secretes neurotoxins and causes what is known today as a red tide. As that name suggests, some of these algae, which can stun fish and eat away their flesh, contain a red pigment. Along with blood from the dying fish, that could have accounted for the river turning red, said the two scientists. The resulting environmental conditions would thus have tipped a delicate ecosystem into catastrophic imbalance. The scientists theorized that a mass death of fish would have freed the spawn of frogs from their natural predators. The second plague was an explosion in the frog population (Exodus 8:1–15). The scientists theorized that a mass death of fish would have freed the spawn of frogs from their natural predators and given rise to an inordinate surge in the frog population. They reasoned that the frogs would have fled the toxic river waters and migrated in huge numbers to the land, where they would have died, decomposed and created the great stink the Bible describes (Exodus 8:14). Furthermore, toads of the genus Bufo seemed to fit the biblical data convincingly. They are common, hugely prolific, and drawn toward sources of light and heat (Exodus 8:3). The next calamity was a plague of lice or, as some translations have it, gnats (Exodus 8:16–19). After the frog population died out, the insect population would have been free to multiply without interference from their natural predators. The most likely possibility in light of the biblical data, Marr and Malloy felt, is that the guilty insect was Culicoides canithorax, a biting midge that increasingly has been associated with viral infections in both animals and humans. This was followed by a massive infestation of flies (Exodus 8:20–32). Of course, all the dead fish and putrefying frogs lying around in the Egyptian heat were “heaven sent” for a plague of flies. The probable culprit, said the epidemiologists, was the stable fly: it can produce large swarms and can bite, leaving open puncture wounds that expose the victim to the danger of secondary infections. The fifth plague was a catastrophic disease of domesticated animals (Exodus 9:1–7). Marr and Malloy concluded that this plague was epizootic—an outbreak that affected animals but not humans. Two known viruses of this type, causing African horse sickness and bluetongue, are spread by the Culicoides midge, and between them they affect horses, mules, donkeys, cattle, sheep and goats. Of the animals listed in the biblical account, all but the camel would thus have been affected. Furthermore, the Culicoides is a very weak flier, so herds and flocks outside the insect’s normal distribution range—such as in the land of Goshen—may well have escaped. A devastating outbreak of boils came next (Exodus 9:8–12). It is not too hard to imagine that in the presence of all these biting insects and purveyors of disease, skin eruptions such as boils would break out on animals and humans alike. The scientists suggested that a bacterium known as Pseudomonas mallei was probably responsible for this sixth plague. It causes a highly contagious infection that can be spread through the air and by fly bites. It affects both animals and humans, causing the lymph nodes to swell and suppurate—a condition called glanders. The most likely carrier of the bacterium, according to the study, was once again the stable fly. The seventh plague was an unprecedented hailstorm (Exodus 9:18–26). Marr and Malloy commented that the coincidence of a violent hailstorm following on the six previous plagues would have been cruel timing, to say the least. It added insult to injury, and its effects would have been disastrous. In our own time, hailstones have been known to be 5 inches (13 centimeters) in diameter, and some hailstorms have left more than three feet (one meter) of ice. A similar storm could have caused all the reported damage done to the Egyptians, killing both humans and animals caught out in the open. Clouds of locusts now arrived on a scale never before (or since) seen in Egypt (Exodus 10:3–15). The two scientists claimed that the desert locust, Schistocerca gregaria, was the likely cause of this plague. They can swarm in huge numbers and consume every piece of vegetation in their path. In fact, a one-square-mile swarm can contain up to 200 million locusts. The largest known swarm covered 400 square miles and comprised an estimated 40 billion insects. Depending on wind conditions, a swarm can move from a few miles to hundreds of miles in one day. The penultimate plague was a blanket of intense darkness that descended on the land (Exodus 10:21–26). The scientists concluded that it may have been caused by a khamsin—a hot southerly wind sweeping in from the Sahara to create fierce sandstorms. Marr and Malloy noted that such storms typically last two to three days and can bury entire buildings with fine sand, blotting out the sun in a dark, dusty haze (Exodus 10:22–23). Accumulations of sand would have blocked exits from buildings, preventing the occupants from leaving. Furthermore, the worst of these storms is known to take place in March—about the time of year when the ninth plague would have occurred. Finding a rational explanation for the tenth and final plague, in which the firstborn died (Exodus 11:4–8; 12:29–30), presented the two scientists with perhaps their biggest challenge. They ultimately decided that the likely cause was mycotoxins. These could have been introduced, they suggested, by locust feces contaminating wet crops that the Egyptians had rushed to save. They could have thrived in the damp and fetid conditions of the sand-covered grain stores. The mold Stachybotrys atra creates such a toxin, known as macrocylic tricothecenes. The symptoms of this toxin in both animals and humans include massive internal bleeding in the lungs and intestinal tract, resulting in sudden death. Only a very small amount of the toxin would have been needed. Finding a rational explanation for the tenth plague, in which the firstborn died, presented the two scientists with perhaps the biggest challenge. Marr and Malloy conjectured that the first animals to feed would have been the most dominant—typically the eldest. Likewise, they said, firstborn humans would have been fed first and would even have received double portions. Mycotoxin poisoning could have happened either by breathing in the unventilated air of the grain stores or by eating food prepared with contaminated grain. The deeper stores of grain may not have been affected by the surface-growing mold, sparing humans and animals that fed later. The scientists believed the Israelites would have escaped this mycotoxin poisoning for a number of plausible reasons. The land of Goshen was spared several of the plagues that caused food shortages and famine elsewhere in Egypt. In addition, the Israelites’ understanding of food hygiene and safety might have been reflected in their Passover meal, the key elements of which—newborn lamb, herbs and unleavened bread—would have been safe from mycotoxin contamination. Marr and Malloy’s fascinating and ingenious detective work seems at first to provide compelling scientific explanations for the 10 plagues and the order in which they happened. But one problem with searching for a rational answer to what are characterized as plagues from God is that such answers fit all the biblical data only with the greatest of difficulty. While superficially attractive, their explanations break down in the face of the recorded details. Not least is the fact that the biblical narrative says each plague began and ended according to a timetable defined by God and Moses (see, for example, Exodus 8:8–10), and not by any combination of natural occurrences. Furthermore, according to best estimates, the entire period covered by the plagues may have spanned many months, thereby bringing into question some of the causal links advanced by these scientific theories. The plague of hail, for example, appears to have taken place around late January or early February when the wheat was not yet grown (see Exodus 9:31–32). This would be some two months before the final plague. Additionally, each plague was to demonstrate the power of God rather than the effect of capricious natural environmental variations (Exodus 9:13–16). Various other questions remain unanswered. How did a fatal algal infection get into every wooden and stone container (Exodus 7:19)? If the Nile turned to blood for seven days (Exodus 7:25), how is it that the frog eggs did not die along with the fish? Or how did those eggs develop in such a short time into frogs that could escape the toxic river in order to survive on land? How was it possible for all the firstborn to die around the same time—midnight (Exodus 12:29)? And were the Israelites really spared by their diet on that occasion? The biblical account says that if they daubed the blood of a freshly killed lamb on their lintels, God would pass over their dwellings (Exodus 12:5–7, 13). While accepting that such scientific sleuth work may be valuable in its own right for the insights it turns up, one must conclude that there is no assurance the plagues actually took place in the manner Marr and Malloy suggest. Indeed, much of the biblical evidence suggests that the reality was quite different from the rational explanation offered. Much of the biblical evidence suggests that the reality was quite different from the rational explanation offered. For believers and nonbelievers alike, this apparently scientific explanation for the plagues of Egypt seems quite unsatisfactory. The biblical account clearly states that God sent the plagues, with Moses acting as His direct agent in the process. Marr and Malloy’s explanation simply does not adequately account for all the recorded details. But even when science and archaeology demonstrate that various accounts within the Bible are completely credible, this approach surely misses an important point. The veracity of the Bible, including the plague account, does not rest on whether we can prove it scientifically. If we take such an approach, we will also stumble at other points in the biblical narrative that cannot be understood by rational thought; for example, the parting of the Red Sea, Joshua’s long day, and the miracles of Christ. The authority of the Scriptures rests not on their being corroborated by science but on their being God-inspired and preserved as an accurate and reliable guide to His perspective on life. “All Scripture is given by inspiration of God,” wrote the apostle Paul, “and is profitable for doctrine, for reproof, for correction, for instruction in righteousness” (2 Timothy 3:16). God claims to be sovereign and the creator of heaven and earth, as well as creator of the laws that sustain them. As a result, He may do as He pleases. God is well able to work within the laws He has put in motion and marshal them to His will and to suit His purpose—regardless of whether we may yet have “discovered” them. Equally, He is able to act seemingly outside those laws—because only He knows the fullness of how everything works. The skeptic desires to discount anything that smacks of being supernatural. Indeed, there is something in every person’s human nature that rebels at the notion of some higher power being in a position to morally dictate how we should live, or instruct us to behave in ways we may find hard to accept. This is surely a commentary on an important principle found in the Scriptures: “The carnal [natural] mind is enmity against God; for it is not subject to the law of God, nor indeed can be” (Romans 8:7). Something in the normal thinking of human beings toward God and His revealed way is not right and is in need of being changed. When you come right down to it, one of the central lessons of the 10 plagues is not so much how they happened but why they happened. Pharaoh’s thinking, and that of his entire nation, was in gross error. According to the Bible, Egyptian life was based on a vacuous and idolatrous allegiance to gods that were no gods. The historical account of the 10 plagues should teach us that any society that becomes hooked on false gods—whatever they may be—and disregards the true God is likely to come under God’s divine judgment. The world of the 21st century is spiritually adrift. When God sets His hand to rescue it, as He promises to do, the results will be no less spectacular than they were for ancient Israel.